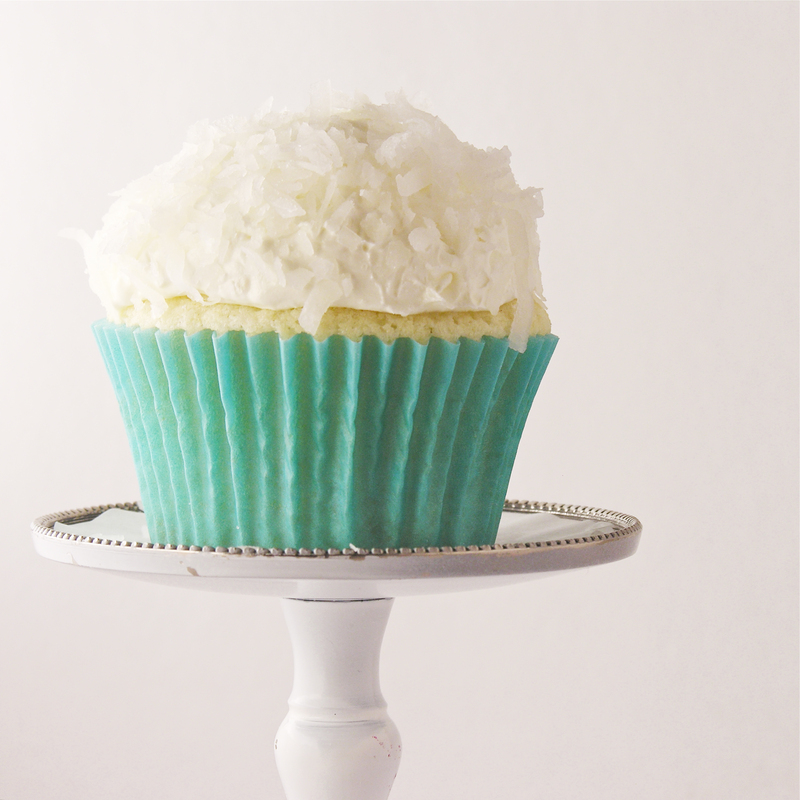 These coconut cupcakes are infused with coconut cream and topped with smooth coconut buttercream frosting….YUM!!! Coconut is one of my very favorite flavors. So many people dislike it and I just can’t understand!! Starbucks used to have the most amazing coconut mochas– discontinued due to lack of interest. Recently, Cheesecake Factory discontinued my favorite cheesecake- coconut cream pie. What is this world coming to? 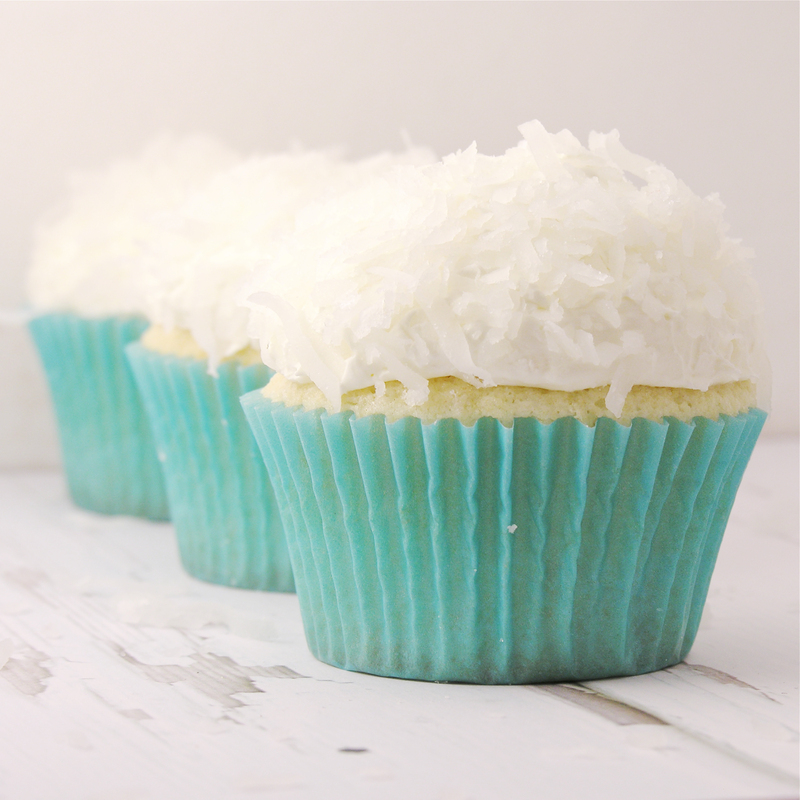 If you like coconut, you will enjoy these cupcakes so much- they are positively bursting with coconut flavor. Honestly, they are my new favorite cupcake, followed closely by cookie dough cupcakes. If you don’t like coconut you should make cookie dough cupcakes. You need cupcakes today. 2 sticks (1 cup) of butter at room temperature. Add flour, sugar, baking powder and salt to a large mixing bowl and using an electric mixer combine these dry ingredients well. Cut (room temp!) butter into 1 tbs pieces. Add these pieces one at a time to dry ingredients while blending on low speed. In a smaller bowl, whisk together the rest of ingredients. Slowly add half of liquid mixture to dry, while mixing on medium. Mix until completely combined. Slowly add the rest of the liquid and mix on high for about a minute until well combined. Divide batter into 12 cupcake liners in a cupcake tin. Bake for 15-18 minutes until a toothpick inserted into middle comes out clean. Allow cupcakes to cool in pan for about 5 minutes before transferring to a wire rack to cool completely. 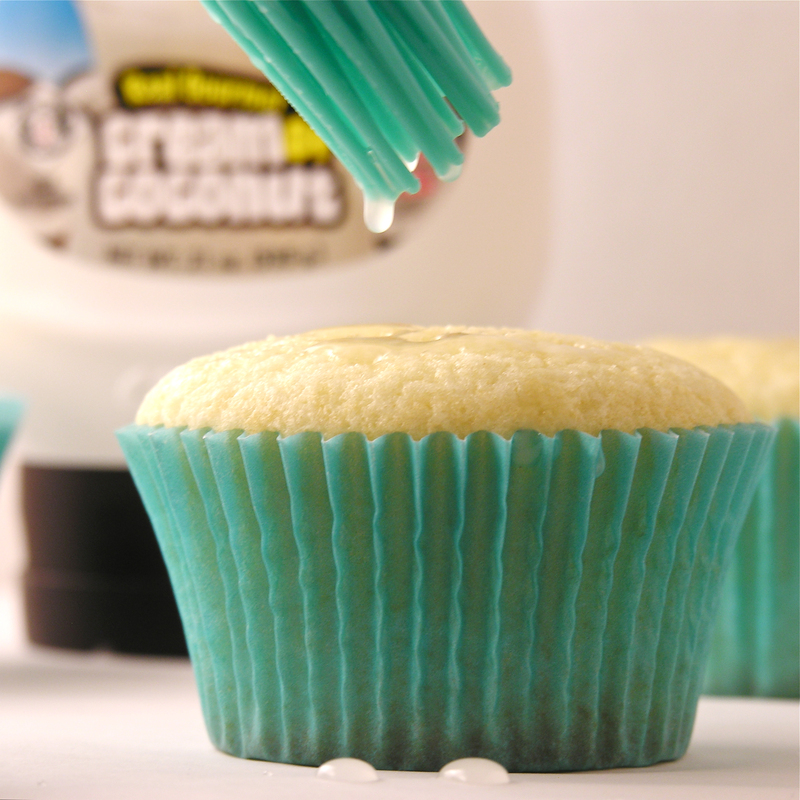 Poke holes into tops of each cupcake and use a pastry brush to brush coconut cream on top of each cupcake. 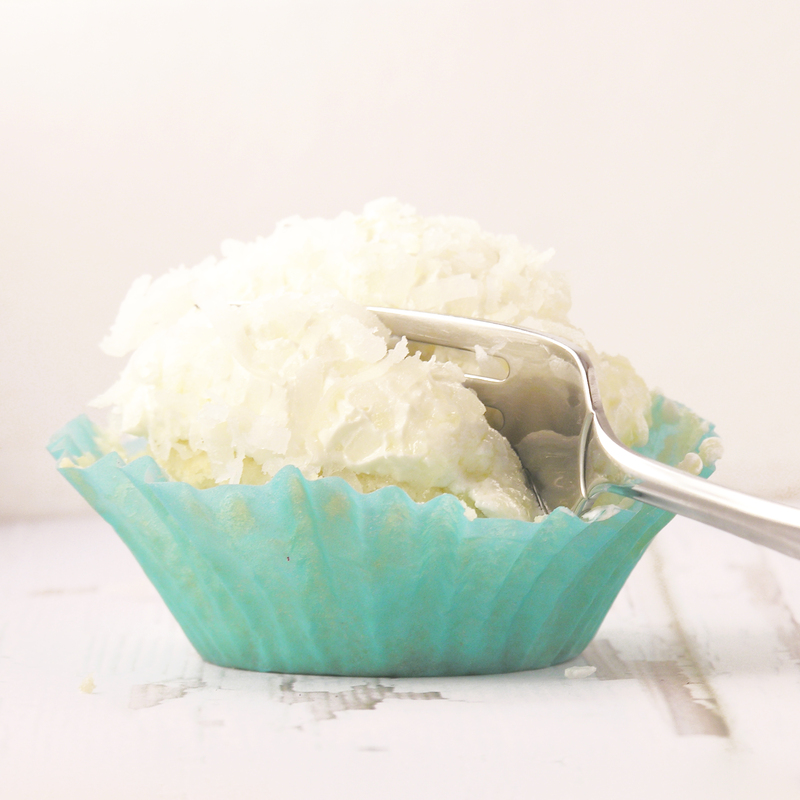 Allow coconut cream to soak in while you make icing. Add all ingredients except shredded coconut into a mixing bowl and combine with a mixer on low. Then whip on high until light and fluffy. Frosting will be an off-white color because of the butter. To make it more “coconut” colored you can add white food coloring gel to your desired shade of white. Add shredded coconut and blend well. Scoop icing on top of each cupcake using a cookie scoop. Evenly divide icing among the 12 cupcakes. Press coconut on top and sides of entire scoop of frosting. Love cupcakes? 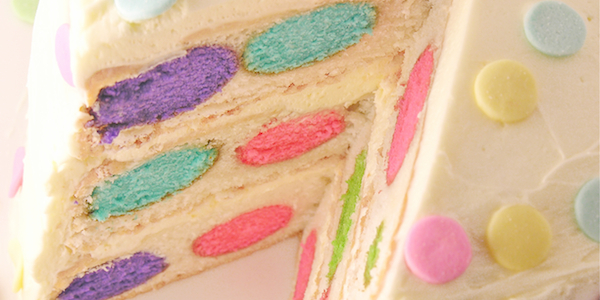 Try one of our four most-viewed recipes! Posted in Cupcakes and tagged baking, best cupcake recipe, coconut, coconut buttercream, coconut cream, cream of coconut, cupcake, dessert, homemade cupcakes, photo, recipe, shredded coconut, vanilla, white cupcakes. Bookmark the permalink. I love your blog! I was wondering where you get the cute cupcake papers and why do mine seperate from the cupcake when cooking?? Thanks. Mine have pulled away from the liners when I don’t let them cool completely on a baking rack before putting them in a sealed container. I think it’s a moisture issue. What I hate is when you put the batter in and it pulls the edge in and puckers. I’ve not had that problem with these two brands. Good luck!! Are there any substitutions for cake flour? I’m with you, LOVE coconut. Your cupcakes are beautiful and look absolutely delicious. I have never heard of white food coloring, learn something new every day!! Just wondering about the coconut cream – you don’t mean cream of coconut, do you? Is this just the rich stuff at the top,of the can of coconut milk? What pretty cupcakes! Great job! Great post. Your photos make me so hungry! Thank you!!! Your blog makes me want to visit Boston– and EAT! Goodness– so many yummy food pictures in one place! Thanks for stopping by! Coconut is the best. These look delicious! I agree- the BEST! Thank you! I have a question that sounds pretty dumb but how do you get half of an egg yolk? And the cupcake looks yummy. Think i’ll fix them for my husbsnd for his birthday in September since he really likes coconut. Thanks !! That’s not a dumb question at all. I just put one yolk in a little bowl and split it in half. It wasn’t terribly exact. I read about 20 recipes for white cake from scratch before I thought mine out. For white cake there are typically no yolks included at all- but I read in several places that adding a little big of yolk helps them hold together better as cupcakes. I was going to put a whole yolk in, but I really wanted a pretty WHITE cupcake- so I went with half. I’m sure using a whole one would work just fine though. These are a little fussy- since they are from scratch- but SO worth the extra time. I think your husband will love them! Have fun!! They look almost too delicious! And your photos are gorgeous as always! I just made these. They’re pretty good except that the frosting is VERY buttery! I know its buttercream, but i think it way to buttery. You can’t really taste the coconut, all you taste is butter. Maybe its just me. Sorry you didn’t like the frosting! One tip- make sure you beat it until it is very fluffy and light- and if you need to, add a touch more coconut flavor. These are more labor intensive than I like, but the look of them just made me decide to give these a try. I have to go get the coconut first, though. Thanks for sharing. These are a little bit of work. 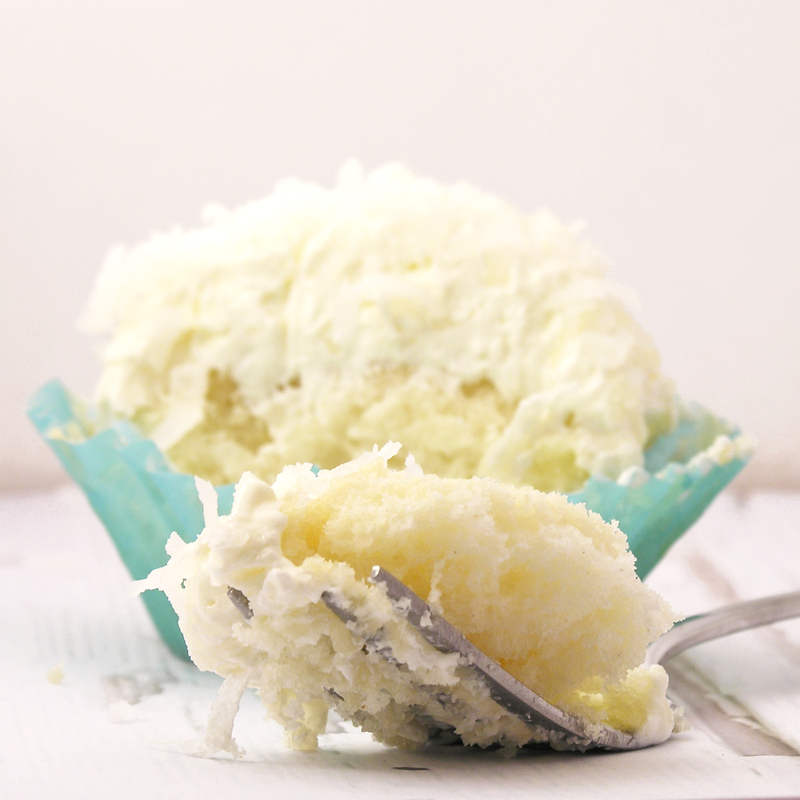 I generally stick with cake mixes as a base for my cupcakes- but these are worth the extra work….SO full of coconut flavor. I think you will love them. I have a pina colada cupcake recipe coming out in a few weeks and they are a bit easier and full of yummy coconut too- keep an eye out for them! Enjoy!!! 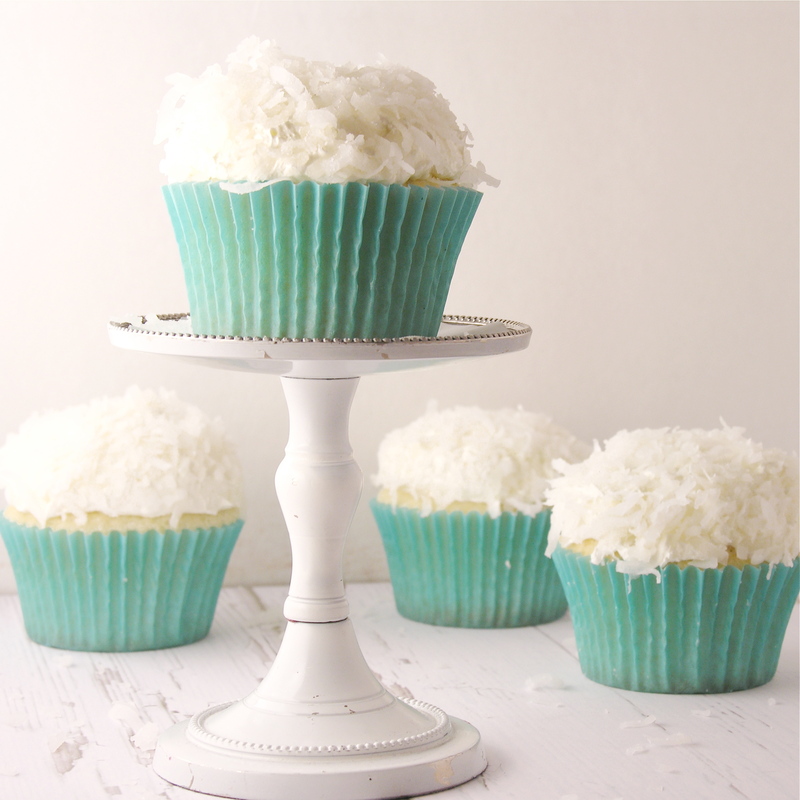 I love coconut cupcakes, but never made them at home! I love the way the frosting sits on them! Awesome! Thank you! The frosting on these makes me happy too 🙂 I adore coconut…..! Pingback: Cupcake Roundup: 25 Delicious Cupcake Recipes!